Pond Cleaning, Pond Maintenance Packages, Spring Waterfall Clean-out. Servicing the Twin Cities, Rochester and Southern, Minnesota Area. looking its best. Our waterscape cleaning packages helps to set your mind at ease in knowing that your system is getting regular check-ups. Like an automobile, routine maintenance will help ensure your system runs smoothly and can help avoid more expensive repairs in the future. Waterscape systems also change over time – plants grow in thicker and frost may shift boulders. It is nice to have a “fresh” looking feature year after year. We strive to educate our customers in order to help them make the best informed decisions for their pond maintenance schedules. Some ponds and waterfalls need to be cleaned-out more frequently than others. 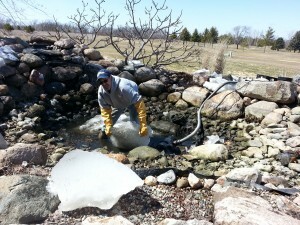 We have some clients where we clean their pond only in the Spring. Others we as often as twice a month. We work with you to develop a cleaning schedule that is consistent with your goals and your budget. 1.) We have cleaned lots of different pond styles in Minnesota!As soon as the ice thaws we are cleaning water features around Minnesota. From simple bird bath rock column fountains, to elaborate koi ponds with bottom drains we have you covered. We have worked with virtually every type of pond filtration system and major pump brands in the industry. 2.) We are a full service pond waterfall installer! This means that we also understand the heart of your pond and waterfall system. Often when we service ponds we did not install we find burned out pumps, leaking skimmers, cracked waterfall boxes, leaking underwater lights, etc. We are able to complete these repairs and get you back up and running. 3.) You don’t have to get dirty and you save your weekend! Lets face it – its a dirt job but someone has to do it! We actually enjoy pumping out muck from ponds and dividing water plants. Unless you really enjoy this too we recommend having us do it. Aqua Eden uses specialized equipment and vacuums. What might take some homeowners all day or the entire weekend, we can often knock out in a few hours! 4.) Artistic Eye for Spring Pond Maintenance Work! Winter in the Twin Cities can be hard on the aesthetic look of a water feature. Some boulders may shift out of place and some aquatic plants may perish. We put these elements back so they are in harmony with the landscape. Often times we notice that koi fish have started to outgrowing their pond. We will often shift rocks around and take out excessively thick gravel (a common problem in many ponds in Minnesota) to make more room in the pond and help the water circulation in the pond. 5.) Our Winter Fish Baby-sitting Service! We are one of the few Minnesota companies that offers a koi and goldfish winter care service. We take your fish in the Fall back to our shop and watch them all Winter. We then bring them back to your pond in the Spring during your clean-out and system start-up. This drastically cuts back on worrying about performing winter pond maintenance via watching aerators and pond heaters to keep your fish alive. The recent Winter has not been nice to fish in MN! Let us help you find the custom pond maintenance package for you! Contact Us or set-up a Pond and Waterfall Design Consultation today! If you would like to perform your spring pond cleaning yourself, here is a great series on How to Clean a Pond. 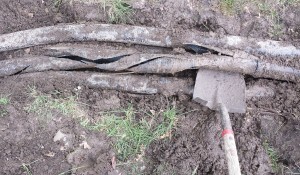 Brought to my colleague “The Pond Digger” in California. The basic guidelines are the same, just ignore the palm trees and tropical plants and imagine Minnesota native plants around the pond!